Tooth extractions involve far more than just pulling a tooth out of your mouth. Adult teeth have intricate root systems, and they are firmly embedded in your jaw and gum. Even teeth that have been damaged or undergone trauma and have become loose require careful extraction. Dr. Chi Fu at Chester Hill Dentistry offers careful and gentle tooth extractions, as well as restorative dentistry afterward. Tooth extraction is not a dental procedure that is undertaken lightly. Your Rye, NY, dentist will do everything possible to save your tooth before embarking on an extraction. Measures that are typically considered first to treat damaged or problem teeth can include root canal therapy, a composite filling, a dental onlay, or a porcelain crown. Blocking other teeth from erupting. Making room for teeth to move during orthodontic treatment. Root breakage or bone fractures. 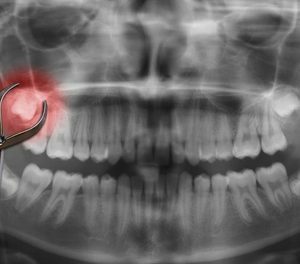 For some patients, a problem tooth needs to be pulled to prevent it from damaging neighboring teeth or affecting the supporting tissues and bone structures of your mouth. If severe tooth decay or infection has attacked a tooth, it may not be possible to repair the tooth, or it may be too costly to undergo a repair, so extraction is the only alternative. Tooth extractions are much more involved than grabbing a tooth and pulling to remove it from the mouth. Even if you don’t have dental anxiety, an anesthetic will be administered first to numb the area and reduce any potential discomfort. During the extraction, you will feel the pressure of the tooth being removed, but you will not feel any pain. The tooth socket must be enlarged using levers to loosen and separate the tooth in question. The actual extraction is usually able to be completed within a matter of minutes, but there is a great deal of work that must be done in that brief amount of time. The surgical site will be washed out and your Westchester dentist will ensure that the infected tissues, bone, and tooth fragments have been eliminated. Some bleeding is normal following the procedure, and gauze will be used to staunch the blood flow. Bleeding will be minimal but may last for a day or so before tapering off. After a tooth extraction, it is essential to follow your Rye Brook dentist’s instructions about how often to change the gauze, what you can and cannot eat, and other post-procedure steps. These efforts minimize any complications and promote healing. When you have a tooth pulled, you then are left with a hole in your smile. This isn’t too problematic if the tooth that has been pulled is a back molar. You have time to address the situation and the area and get it filled when you’re ready. However, if a more noticeable tooth has been extracted, you will need to replace this area as soon as possible so your oral health is not compromised and your smile is not marred. Typical restorative dentistry solutions after tooth extractions include a dental implant, dentures or partials, a porcelain dental bridge, or other restorative dentistry solution. Dr. Fu and his Chester Hill Dentistry team are experienced in tooth extraction and are prepared to make your dental visit as painless and comfortable as possible. If you need to talk about an extraction or get a second opinion, contact our Rye dental office to schedule a consultation or appointment.